Canvas Printmaker Blog: Laser v Inkjet - which is best? Laser and inkjet printing have been around for a long time. 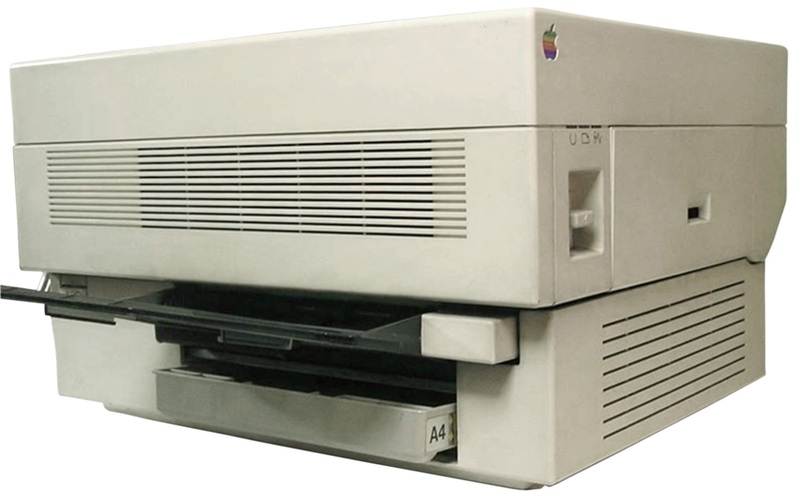 Apple Laserwriters have been around since the late 80’s and Epson Stylus Colour inkjets from the early 90’s. So surely by now the confusion over which is best for printing should have been put to bed a long time ago? Well, it seems there is still a lot of confusion out there…..
Back in the good old days, printing had its roots based on typing. Daisywheel printers used to spin a disc around and physically type a letter, number or symbol onto the page. This was a vast improvement with typing but it was no use for printing pictures or designs. Then along came dot matrix and thermal printers. Dot matrix printers were similar in design to daisywheel printers except instead of glyphs they used a dot matrix grid to strike the ribbon onto the paper and moved back and forward much like an inkjet. This meant that you could print anything onto paper including pictures (albeit badly). Thermal printers used heat to react with the specially coated paper to change it to black. However, thermal paper was mostly unstable and given enough time or exposure to light it would completely turn black and anything printed on it would be illegible. They caught on with the fax industry and till / credit card receipts but not for mainstream printing. Inkjet was next and what a difference to the world they made. This was the first real contender that could actually compete with traditional photographic printing. In the early days the resolution wasn’t there and the colour gamut by today’s standard was poor but the potential was there. Back then an Epson Stylus Colour would set you back £500 and the inks were £30 each. These days the printers are £50 and the cartridges are still the same price! Laser printing was also starting to take off at this stage. Adobe’s memory hungry postscript was starting to get replaced with manufacturer’s drivers which worked faster, more accurately and with a lot less hassle. Hewlett Packard played a leading role in getting laser printers to actually print what you wanted quickly and accurately and without all the drama that a Laserwriter would cause. Apple, of course didn’t do themselves any favours by producing lots and lots of incompatible drivers much to Adobe’s dismay. Over time both technologies steadily improved with each developing their own uses and benefits for those using them. Laser printers were fast, accurate and efficient but could only do black and white. This suited most people, though as they were ideal for printing letters without all the fuss. They were also cheap to run which appealed to I.T. managers. Inkjets, on the other hand, were expensive to run - “How much for a new cartridge, I could buy a new printer for that price! !” Couple that with the fact they were slow to print and always had problems with banding or blocked nozzles. Inkjets were and still are a real hassle, so why did they survive? Colour! It was the single biggest advantage over laser. If you wanted to print a document with colour or a photograph then you had to use inkjet. Dye sublimation was also around at this point but never really took off due to the cost and the enormous waste - each page was made up by transferring ink from a plastic sheet. First cyan, then magenta, yellow and black. Some dye subs just ran on three colours and used all three to make up black which was never really “black”, more “grey”. So for every sheet of A4 you had a minimum of three sheets of colour to create the print. Inevitably the alignment would go out of sync with each pass of the paper and colour or you would go through a whole roll in just one job and run out with two prints to go which would be ultra urgent…… oh dear! Add to that the problem of longevity and dye sub started to lose its appeal quickly. Then along came colour laser printers - oh how the I.T. managers celebrated the thought of dumping all those problematic inkjets. That was until you tried to print in colour. Oh dear! Dot patterns the size of golf balls and a terrible colour gamut. They were perfect for cheap, colourful and quick presentation printouts but they were never going to compete with inkjet or photographs on quality. Even today I still come across “printer rage” and I don’t blame the people - there is nothing more infuriating than watching an inkjet printer move backwards and forwards for five minutes whirring and chuntering away only to find that it cannot print something properly. Or, it lamely refers you to a manual entry which is about as much use as a chocolate teapot…. Ahhhhhhhhhhhhhhhhh! Only an inkjet could achieve that level of frustration and irritation! So why hasn’t laser taken a big bite out of the inkjet market? After all they are far more reliable and cost effective to run. Well, to answer that you need to understand how laser printers work. A laser printer charges up a drum which the laser then scans over removing charge from the drum. The drum is then exposed to toner particles which electrostatically transfer onto the drum. The paper is then pressed against the drum and toner, then heated in a fuser to melt the toner on to the page. Problems develop when you start to introduce colour as you run across the same problems that dye sublimation has. In order to get the colours the paper has to have four toner colours (cyan, magenta, yellow and black) placed onto it before it goes through the fuser. The difficulty with this is contamination between different toners, alignment issues and lack of colour gamut due to the way the colours are fused together. The lack of colour gamut with toner based laser printers means the software has to compensate with lighter colours by placing dither patterns on the prints - hence the golf ball sized dot patterns. Inkjets don’t have these problems which is why people put up with the terrible reliability of inkjet printing. One interesting fact for everybody using inkjets and laser printers - large format inkjets are considerably more reliable with printing than their desktop equivalents. You are much less likely to come across a blocked nozzle problem with a large format inkjet than desktop inkjet. Also, large format laser printers or electrostatic printers are far less reliable than their desktop equivalents. Electrostatic printers have ghosting issues, toner contamination issues and colour consistency problems at much larger sizes. Quite ironic that size really does matter in the printing industry. So, to sum up: If you wish to print photographs then buy an inkjet but be prepared for a truckload of hassle. If you only want to print letters than buy a black and white laser printer and spare yourself the premature aging that desktop inkjets bring about. Alternatively you could always get a proper lab to print your photos and spare yourself all that grief!